Over the last few months, my garden has suffered from the heat and from my neglect. I haven’t taken care of it as well as I should, as well as I have. In the last update I wrote about it, my tomatillo plants were still tiny. I was filled with hope that they would grow and I would have huge crop. That didn’t happen. Maybe it was the heat, maybe it was the humidity. I don’t know. 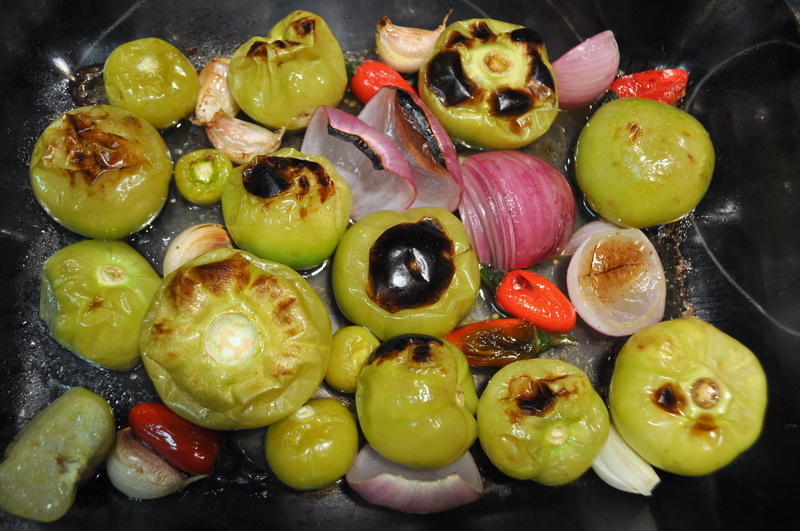 I love tomatillos so I was crushed. At least I can still get good ones from the store! When deciding what to cook for this blog next, I stumbled across a renewed love of shrimp. It seems like sometimes, they are the most boring food in the world and sometimes, they are the only thing I can think of until I get some. I didn’t want to go with the ordinary taco or stir fry so I choose a burrito bowl. So many great ingredients, so easy to assemble. Such great leftovers! 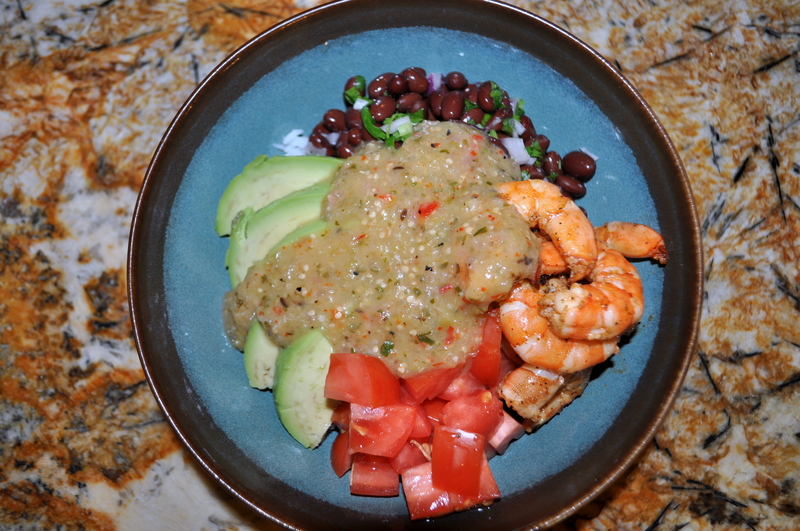 For this one, I grilled shrimp and added chopped tomatoes, black beans with cilantro and lime, and fresh avocado from my favorite neighborhood vegetable stand…and lots of tomatillo salsa! This salsa doesn’t have to be used as a topping for an entree. I actually plan on eating most of it with simple tortilla chips. Any one of my friends or family could tell you that I basically live off chips and salsa. It is my favorite snack and sometimes, when I can’t bring myself to cook after a long day, becomes a meal as well. All the elements I love are hit in this wonderful snack – salty, crunchy, acidic, spicy. I can’t wait to have chips with this homemade tomatillo salsa! No matter what you plan to do with it, make extra salsa. It will get eaten!